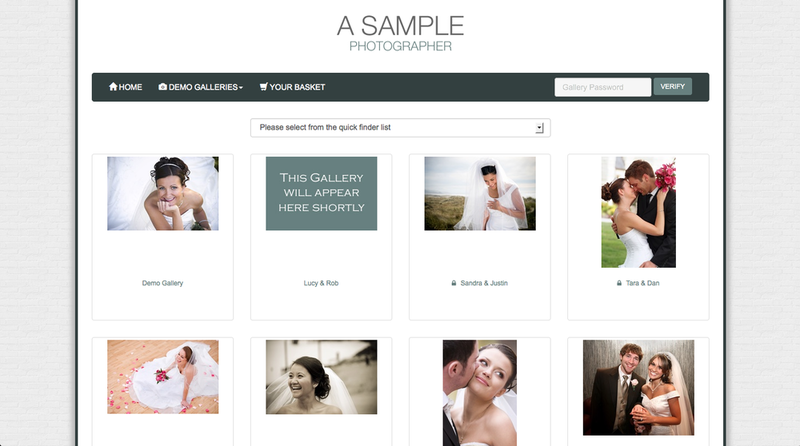 Providing online client galleries, so people can share their images with loved-ones is a pretty standard service for all wedding and portrait photographers. However the ability to make print and download sales from these galleries often gets overlooked... if not completely ignored. I was 100% guilt of this! I didn't want the hassle of providing prints and whenever I looked around at all the options I just felt overwhelmed. So, as everyone was raving about it (at the time), I used PASS for a free 30-day proofing gallery, upgrading it for my wedding and portrait clients - and I used Dropbox for sharing styled shoots and hi-res files with commercial clients. This was all fine and dandy, until I caught a glimpse of a tweet convo between some well known wedding photographers talking about how they'd increased their print sales by over 150% with a few nifty email marketing techniques!! In the age of digital? Yes! In the age of digital people still value and are willing to buy professional prints. But money aside, offering your clients an easy way to purchase prints is actually just good customer service. If you're paying good money for a quality photographer, you should be able to get all your photographic needs met by them, which includes print and album offerings. PASS is great for sharing photos easily and seeing how many people around the world have viewed + downloaded your images. But it lacks a lot of flexibility when it comes to print options - all print orders go through PASS and are fulfilled through WHCC. PASS also lacks the ability to collect the email addresses of people viewing your photos and market to them... so the opportunities for us UK photographers to make money from PASS ain't good. 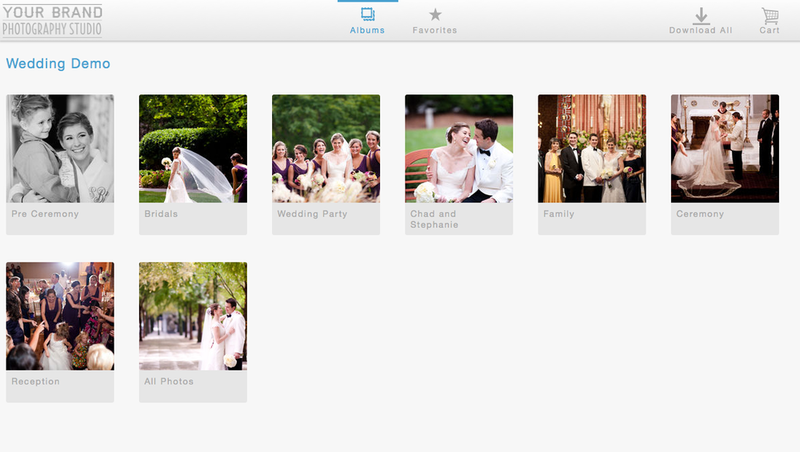 Viewing client’s favourite selections, (important for album image choices). Adding a watermark to prevent screen capture, but ensuring this watermark is removed for any permitted downloads. This is a screen shot of my word document. If you want to view it as a PDF you can download it here. Pros: Looks good, easy to use, zero commission, you can self-fulfill orders, it has a Lightroom plugin for uploads, you can apply your watermark which is removed when images are downloaded. You can upgrade as you require more space, and you get free music to accompany your slideshows. Cons: Limited customization, no lab partners in the UK and expensive with a yearly cost of over £200 for the amount of space most full-time wedding photographers will need. Example of a basic layout. Pros: UK based, lots of customization options, with the ability to fully integrate it within your existing website, you can self-fulfill orders, and it has a sophisticated email marketing system. Cons: The price plans aren't straight forward and are a little expensive - to get all the features I want I'd have to spend £228 a year. They have limited options when it comes to their lab partners and there's no mention of a Lightroom plugin. Pros: No annual or monthly fees - you only pay commission on what you sell, you can self-fulfill orders and it has a sophisticated email marketing system. Cons: The demo store front pages aren't very pretty and you have limited customization options. The facility to add hi-res storage is available, but they don't specify how much this costs - without paying for storage your images are limited to 1280px on the long side... which means you have to email the original files if you want to offer digital downloads. Pros: Looks really good, is easy to use, no commission charged on upgraded accounts and you are able to self-fulfill print sales. Cons: Quite expensive given its limited features, it would cost me roughly £175 a year to get the amount of storage I need. There's no Lightroom Plugin and there's no mention of the email marketing capabilities. 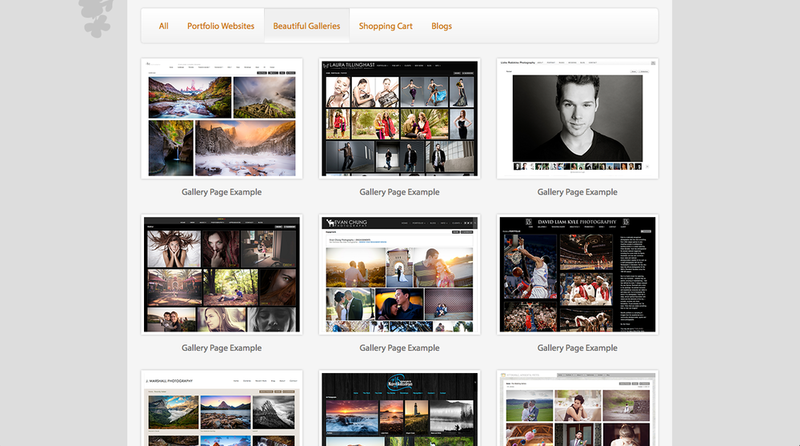 Pros: Loads of customization options and great value for money as you're paying for a fully hosted website + blog along with your client galleries - plus you have the option to just use client galleries if you already have a website. You get unlimited storage from just £50 per year. The ability to store RAW files if you want, upload from Lightroom and export client favourites into Lightroom! It also comes with a sophisticated email marketing system. Cons: Unless you go for the business premium package (at £150) you'll be paying for hosting and paying between 5-15% commission on sales too. I'm going to go with Zenfolio! For £150 the range of features on offer far outweigh anything that the other monthly/annual fee sites offer. If you don't want to risk paying an annual fee but still want to make the most out of print sale opportunities I'd go with Instaproofs. The key to success is the ability to capture email addresses and then stay in touch with those people who've shown an interest. 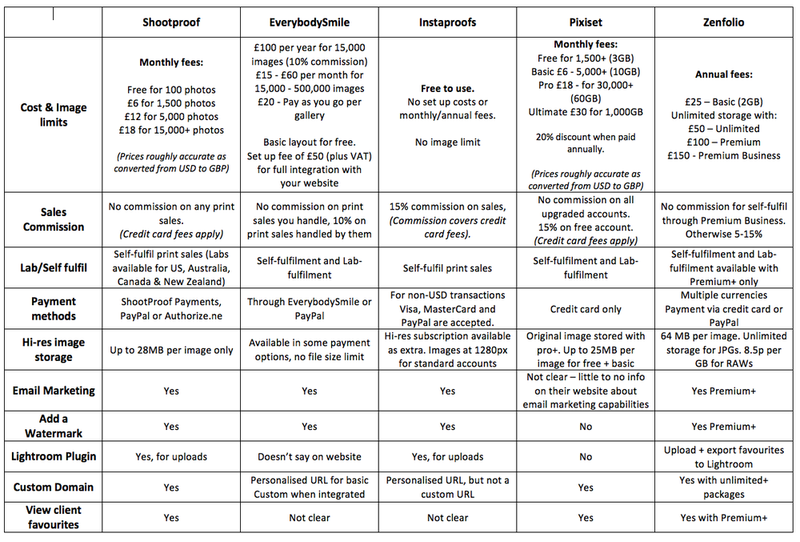 Both Zenfolio and Instaproofs offer this, so really it's just a question of £150 upfront vs 15% commission on your sales. I'd love to hear who do you use for client proofing galleries... have I missed anyone out? Was this blog post helpful, if not, what information was left out that you really wanted to know? And if you have any tips on how to get those print sales rolling in, please share.